Our approach to working with children begins by understanding that we are not just treating teeth, but rather a unique child. 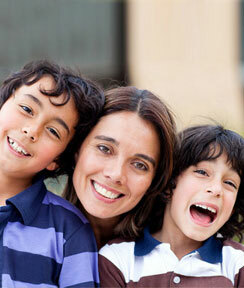 Our methods vary depending on the personality, temperament, and age of each child. A cautious child may require more time to warm up to a new situation. Other children may be sensitive to flavors or textures. We attempt to treat problems in teeth by addressing their causes, rather than just treating the symptoms. We always discuss pros and cons of treatment, as well as any alternatives. Most importantly, we encourage questions from parents and children. We make every effort to use biocompatible and low-toxicity ingredients. We perform a thorough evaluation of all ingredients we use to look for any potential adverse consequences. Our office does not use mercury or Bisphenol-A. All X-rays at Dr. Pike’s are performed using digital technology. The use of digital radiography reduces the amount of radiation by approximately 70%.